The heart of the mission of LMCI is to provide relevant biblical instruction to help liberate you and your ministry. One of the first steps in being liberated is to know what your personal ministry is. 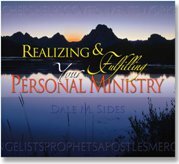 To read the Realizing & Fulfilling Your Personal Ministry free e-book, click on the above photo or on the corresponding link in the left column of this web page. To take the online version of the Spiritual Gifts Evaluation, please login as a registered user of our site. 1. Click here to become a new registered user. 2. If you are already a registered user, please login. We also offer a hard-copy version of the Spiritual Gift Evaluation in PDF format which you can print and take offline. Please click here or on the following links in the left column of this web page to view and print the corresponding files. May all of us grow up in all things into Him who is the head—Christ—from whom the whole body, joined and knit together by what every joint supplies, according to the effective working by which every part does its share, causes growth of the body for the edifying of itself in love (Ephesians 4:15b-16 NKJ).